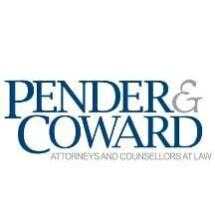 For more than a century, Pender & Coward has been dedicated to the success of its clients, representing businesses of all sizes, governmental entities and individuals. The firm’s 38 attorneys practice throughout the Commonwealth of Virginia from offices in Virginia Beach, Chesapeake and Suffolk and remain committed to accomplishing client goals through proven experience, diligent research and effective communication. For more information, visit www.PenderCoward.com.